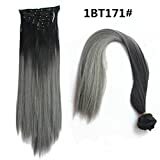 Products Name: Balayage Ombre Remy Tape Human Hair Extensions; Colour: Colour #8 Fading to Colour #60 Platinum Blonde Balayage; Different Monitors Will show color a bit different; Length: 22″; Quantity: 20pcs/Pack; 50gram.40 to 84 pcs is suggested for a full head.Quality: Thick End but is not double drawn, Tangle Free Shedding Free. Balayage Ombre Hair is the Symbol of Full Shine Hair. And we are working on improving the quality of hair and tape bonde. We choose the best hair and are changing the tape to find a best tape for our product. Texture: Straight, and have a natural wave when wet or left to airdry or diffused. Colour:colour #8 Fading to #60 Plautinum Blonde. About Quantity: 40-80 pieces are recommended for whole head. About Style: Our remy tape hair extensions are just like your own hair and can be styled, curled or straightened as desired. About colour: They can be coloured but not lightened. But always test a small sample when you dye. About wash: Everyday Wash is not good for your extensions, especially when you first apply the hair. Wash the hair every 3 days is better.Use sulfate free shampoo and conditioner on the hair. About Care: We suggest you to use the rub in oil to revive dry hair; Sleep with a silk cap or buy a silk pillowcase will protect the hair. About Usage: Hair Can be reused with replace tape. And we suggest to adjust the tape every 40 weeks to keep the hair stay well. The Hair is applied to your hair instead of the your scalp. Our set consists of 100% pure human hair! The special shine to the hair immediately catches the eye. No damage to your own hair, because the human hair extensions are attached by clips.Fix hair without glue or other chemicals.Always change the color or can be picked up again. We Focus on Healthy&Natural Hair Product Since Year 2005, Produced by 100% Real Human Hairs, Softly Touch&Tangle Free, Washed&Dyed, Curled&Straightened, Free-design for Desired Styles as You prefer. 7pcs set weighs 120g with 16 clips. Clips Stitched on Hairs and Replaceable. Wash your hair extensions gently with a mild conditioning shampoo and rinse in warm water After washing brush with a gentle downward motion starting at the bottom then gradually moving up until the whole length is brushed Do not start brushing from the top or middle this will tangle and damage your hair extensions Do not sleep with wet hair. —Curling temperature better below 330 degrees Fahrenheit. —Hairs weaved through the weft with clips, please be gentle when handling to avoid hair fall off. —Real human hair looks frizzier than synthetic hair but it is health and tangle free. —Extensions will wrinkles after washing, it is normal and please do correct dry procedure to straight it. —To re-coloring the extensions requires particular skills and darker dyeing products. —Professionals suggest better not to curl or dye the hair extensions as that occurs hair quality damage.